We are very proud of the wide range of services we at Warmfront Plumbers can offer and our chimney sweep service is just one of them. If you have a solid fuel burning cooking or heating appliance then a good working chimney is absolutely essential. A chimney will ensure that your appliances are efficient and are also safe to use. It is highly recommended that you should have your chimney cleaned out once a year, at the very minimum, by a chimney sweep that has been approved by HETAS. How often you require your chimney to be cleaned out will depend on the appliance and also the type of fuel that is being used, as some chimneys will need cleaning out a lot more than others. We at Warmfront Plumbers have been approved by HETAS and are members of the chimney sweep trade associates. We can offer you a first class service, that’s second to none. We will ensure your chimney is clean and is in good working order, to ensure your heating appliances and cooking appliances are running efficiently. The whole purpose of a chimney is to allow the movement of air. This will therefore remove combustion gases, which are extremely dangerous. Also, when you clean your chimney you will be removing soot and creosote and this will greatly help to ensure your chimney doesn’t catch fire. By having your chimney cleaned out regularly you will also be ensuring the good working order of your cooking and heating appliances. When you have your chimney cleaned out you will also be able to remove any blockages, bird’s nests and also cobwebs. How often should you sweep your flue/chimney? Well, this will really depend on the type of fuel that is being burned and also the appliance that is being used. If you use your appliance a lot, then obviously, this will mean it will be in need of cleaning much more often. The type of chimney you have and the moisture that is in the wood being used as fuel will also contribute to the amount of times your chimney will require sweeping. 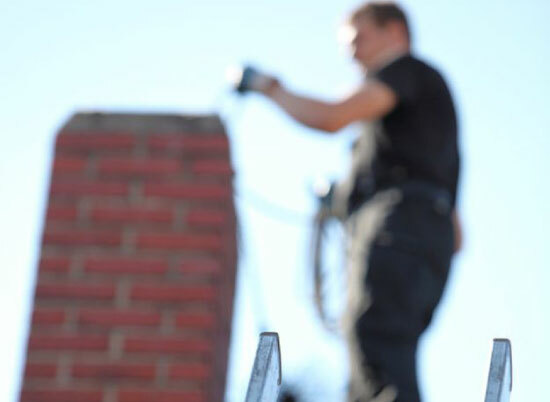 We at Warmfront Plumbers recommend that you have your chimney cleaned out at least once a year. We will check on the type of chimney you have and the fuel that is being burned and will offer you our advice on how often we believe your chimney should be swept. Should I expect a lot of mess? This is a common question that people ask us here at Warmfront Plumbers and the answer really is no, there is very little mess, if any. We have all the experience and skills that are needed to ensure the least amount of mess that’s possible. Sometimes, there may be a small amount of dust, which is mainly the result of a blockage or even a bird’s nest in your chimney, but even this won’t cause anything substantial. What will it cost to have a chimney/flue swept? Well, unfortunately there is no definitive answer to this question as all chimneys are different and they will require different techniques in cleaning them. Costs will also depend on how long it actually takes to clean out a chimney and of course some will be in a worse state than others. For instance, a chimney may take a while longer to clean if there are blockages or a bird’s nest in there. We at Warmfront Plumbers offer very competitive prices when it comes to chimney sweeping and you can be rest assured that you are dealing with professionals that have been trained to the highest of standards. We know and understand all about chimneys and the best techniques that are required to ensure they are cleaned out safely, professionally and with the least amount of disruption to you. So, for all your chimney sweeping needs, let us help you. We pride ourselves on the first class service that we offer our customers. We guarantee that we won’t let you down. For us, here at Warmfront Plumbers, every customer deserves a service that’s second to none and that’s exactly what we will provide you with!